The Smithsonian National Air and Space Museum's new "50 Years from Tranquility Base: Humanity's First Visit to Another World" exhibit highlights artifacts from the Apollo 11 mission. Neil Armstrong's Apollo 11 mementos are among the flown artifacts now on display as part of a new exhibit dedicated to the 50th anniversary of the first moon landing at the Smithsonian's National Air and Space Museum. 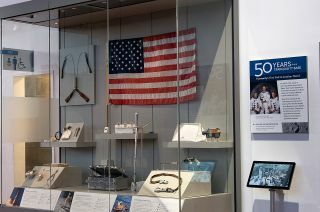 The Apollo 11 "50 Years from Tranquility Base" display case was installed on Monday (March 25) at the Washington, D.C. museum, opposite its Space Race gallery on the first floor. The exhibit offers a look at almost two dozen artifacts that flew on board the July 1969 Apollo 11 mission that landed Armstrong and Buzz Aldrin in the Sea of Tranquility on the surface of the moon. "'50 Years from Tranquility Base: Humanity's First Visit to Another World' highlights some of the smaller artifacts the crew needed to live and work on their way to and on the moon. Of particular interest are Neil Armstrong's Omega chronograph, which hasn't been on public display for over 20 years at least, and some of the items found in Armstrong's purse," said Jennifer Levasseur, a curator in the space history division of the National Air and Space Museum. "50 Years from Tranquility Base" exhibit includes the so-called "Armstrong purse" and some of the Apollo 11 artifacts it held as discovered in Neil Armstrong's closet after his death. Before jettisoning the Apollo 11 lunar module "Eagle," Armstrong also used the purse to collect some spent equipment from inside the moon lander to bring back to Earth as his personal souvenirs. "This bag, which is part of the display along with some of its contents, was found in Armstrong's house after his death. Most of these items are on loan from [Neil's widow] Carol Armstrong, but one of them, perhaps one of the most meaningful in terms of how the astronauts documented the mission, is the first to be formally donated as well," explained Levasseur in a statement provided to collectSPACE.com. An Apollo 11 Data Acquisition Camera is reunited with its 16mm film magazine as last used together aboard the lunar module Eagle in the new "50 Years from Tranquility Base" exhibit. "The Data Acquisition Camera, a 16mm movie camera, has been reunited with the film magazine used during the mission to record Armstrong's first steps on the moon from the lunar module window — a reunion 50 years in the making," said Levasseur. In addition to the camera and the purse, the new exhibit also displays Armstrong's crewman optical alignment sight used during the docking of Eagle to the command module "Columbia" after the moon landing, an emergency wrench from aboard the lunar module and his waist tether. The "50 Years from Tranquility Base" exhibit also returns to public view artifacts that were previously displayed in "Apollo to the Moon," one of the National Air and Space Museum's original galleries that was closed in November 2018 as work began on a seven-year renovation of the building. "Apollo to the Moon" will be replaced by a new permanent exhibition, "Destination Moon," set to open in 2022. "Even before the multi-year renovation showed visibly to the public, we knew it was critical to have exciting and new ways of celebrating the 50th anniversary of the Apollo 11 mission inside the museum to accompany our program plans for the entire Apollo 50th. Not only are we touring a preview of the new 'Destination Moon' exhibition (opening in Seattle in April), we also wanted to show some of our most significant Apollo 11 artifacts," said Levasseur. The display case includes the contingency soil sampler used by Armstrong to collect the first lunar material off of the moon, a lunar sample return container (or "moon rock box"), an inflight exerciser used by the Apollo 11 astronauts and a replica of the U.S. flag assembly that Armstrong and Aldrin deployed at Tranquility Base. Other Apollo 11 artifacts include a pen and penlight flown on the first moon landing mission, the toothbrush and sunglasses used by command module pilot Michael Collins, and even samples of leftover space food with the scissors that were used to open the meal packages. Visitors can also get a look inside the Apollo 11 command module (soon to be on display at Seattle's Museum of Flight) via an interactive "Columbia 3D" feature on a touchscreen positioned alongside the artifacts. In addition to the new exhibit, the National Air and Space Museum also plans to debut Armstrong's Apollo 11 spacesuit later this year. The suit, which has been off public display since 2006, has been the subject of a full conservation effort. "This '50 Years from Tranquility Base' display case reminds us of the care with which engineers, scientists, and others worked to prepare each element of the astronauts' journey to the moon," said Levasseur. "The journey wasn't just 240,000 miles, but the 50 years since, as this museum continues its caring for the nation's lunar legacy." Click through to collectSPACE to see more of the National Air and Space Museum's "50 Years from Tranquility Base" Apollo 11 exhibit.